Santa Claus visited the North Pole Workshop at the Circle in Hasbrouck Heights, NJ on Sunday, November 19, 2000 between 10 a.m. to 5 p.m. Along with his many elves, Santa was available for photos and to talk with children. Bill O'Shea's Florist hosted an Open House that included FREE flowers, balloons, live music, prizes, refreshments and a raffle for a FREE Thanksgiving Centerpiece. 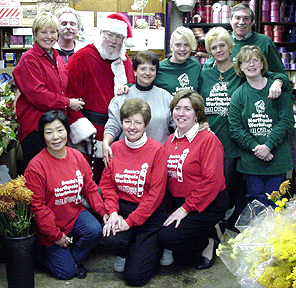 In addition, Bill O'Shea's Florist is offered a 10% discount on all gift items during the Open House festivities.Jukebox Radio 103.1FM broadcasted live from noon. to 2 p.m.., and provided on-air interviews with Santa Claus as well as their guests and visitors to Santa's Workshop.